Synastry—an essential component of relationship astrology—reveals where the potentials and pitfalls exist between two people. It’s often through our most intimate bonds that we truly come to know who we are, and gradually grow into our best selves. As we really let it sink in that all external form is a reflection of one’s internal world, we can harness the mirror magic that intimate partners provide. Perhaps no planetary combo yields more potent magic than that of the Moon and Neptune in synastry aspect with each other. This pairing adds pixie dust to a couple’s relationship. Then again, is it pixie dust or smoke? The nature of the synastry aspect is greatly helpful in answering that question. Bear in mind, with all things Neptune, there is a greater-than-average propensity towards delusion and wishful thinking. Seeing your partner clearly through Neptune’s shimmery veil? Not likely. But the effort may be so lyrical that it inspires poetry. Or tears. Oh dear. Here are some classic Moon-Neptune synastry combos, along with their potentials for magic and muddling. If you want to bring on the magic, look no further than a Moon-Neptune conjunction. Couples who share this synastry are so in tune with each other that they share a psychic shorthand. They experience a deep emotional and spiritual bond, enhancing each other’s intuition. This is the couple who literally think and/or say the exact same words at the same time. Geographic distance cannot undo the mind-meld these two share. In fact, for the Moon-conjunct-Neptune pair, distance adds to the sweetness of yearning for each other. They are so enchanted with each other that they use creative collaborations as an ideal outlet for their feelings and talents. And those creative undertakings are magic, in and of themselves. Here’s where the propensity for muddling comes in: melting so deeply into each other, these two can lose their individual connections to self unless each attends to their own identity and boundary issues. Did someone say boundary issues? That’s a particularly muddling component of those who share a Moon-square-Neptune synastry aspect. Walking through water whilst wearing layers of gauze—that’s one way this energy is experienced. It’s all rather confusing, much like a bewildering dream one remembers in a groggy fashion. The term check your blind spot is a fundamental requirement for the couple who navigates this planetary combo. Use that mantra when determining how truly viable the relationship is. 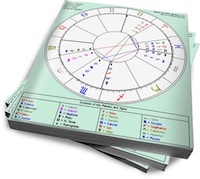 Likely one partner is in deeper than the other, or the lunar partner craves a closer connection, while the Neptunian one feels victimized in some way. Assuming this couple can find an effective way to share their true needs, they will need to worry less about being poetic versus being frank. Neptune in Synastry: Deception or Higher Connection? Michelle Suzanne is a certified coach practitioner. She incorporates her gift for interpreting planetary messages to consult with clients, to teach, write, and to create and deliver workshops to individuals and groups. She brings twenty years of unique professional experience to people who need guidance to rise to their fullest potential. Everyone has a unique journey with a compelling story beneath it. Michelle's role is to help you re-discover yours, or to help you create a new one that resonates with who you are today.